Jacob Brown scored a stoppage-time winner for Barnsley against Walsall on Saturday. Barnsley winger Jacob Brown believes his side hold the upper hand in the League One promotion race, with the pressure now on those behind them. Brown, 20, returned to the Barnsley side against Walsall on Saturday, after serving a three-game suspension, and netted a stoppage-time winner against the Banks's Stadium. 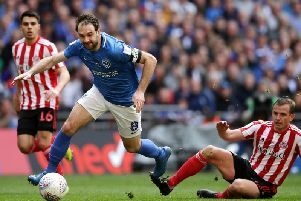 The 1-0 win moved the Tykes five points clear of Sunderland, who dropped to fourth following Portsmouth's win over Shrewsbury. Automatic promotion remains in Sunderland's hands, and Jack Ross' side now have two games in hand on the sides above them. Yet Brown believes his side will take some stopping, after scoring a potentially pivotal goal in the League One promotion race. “That’s the way that we are as a team, we keep going until the end, we never give up," Brown told the Barnsley website. "Whether we’re behind or level, we’re going to be going for it until the final whistle. It’s a massive result, every game is big now. Barnsley could move further ahead of Sunderland when the Tykles host Coventry this weekend, with Sunderland not in action due to the Checkatrade Trophy final. Still, Brown is trying to remain focused on his own side's results. “We’ll keep taking each game as they come, there are still seven games left to play and we have to continue to keep on fighting for what we want.